One of the new features of IDA 6.6 is the Dalvik debugger, which allows us to debug Dalvik binaries on the bytecode level. Let us see how it can help when analysing Dalvik files. There is a data reference, let us see where this string is used (e.g. using Ctrl-X). So, apparently the strings are encrypted with RC4+Base64. Let us set a breakpoint after the RC4.decryptBase64() call and start the debugger. After hitting the breakpoint, open the “Locals” debugger window. Even if the application was stripped of debug information, IDA makes the best effort to show function’s input arguments and return value. Note the local variable named retval. It is a synthetic variable created IDA to show the function return value. This is how we managed to decode the string contents. Let us have a look at application that uses a native library. On a button press, the function stringFromJNI() implemented in the native library is called. Native library function returns a well-known string. So, we have application packaged in hellojni.apk file and installed in Android Emulator. Because IDA cannot analyse or debug both Dalvik and native (ARM) code at the same time, we’ll need to use two IDA instances to perform debugging in turns. load hellojni.apk into IDA, select classes.dex to analyze. go to the native function call and set breakpoint there. change the default port in “Debugger/Process options” to any other value. 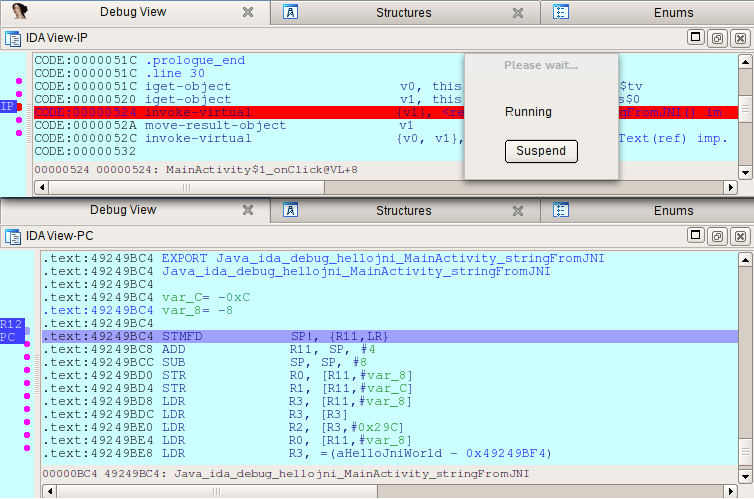 start the Dalvik debugger and wait until breakpoint is hit. prepare to debug native ARM Android application (copy and start android_server and so on). load hellojni.apk into IDA, and now select lib/armeabi-v7a/libhello-jni.so to analyze. .text:00000BEC        ADD     R3, PC, R3 ; "Hello, JNI world!" select “Remote ARM Linux/Android debugger” and attach to the application process. Now switch to the first IDA session and press, for example, F8 to call native function. If we return back to the second IDA session then we can notice the breakpoint event. Now we can continue to debug the native code. When we finish, press F9 and return to the first IDA session. The full source code of the example you can download from our site.